I always wear my heart on my sleeve, my egg on my face, and my internet passwords on my wrist. 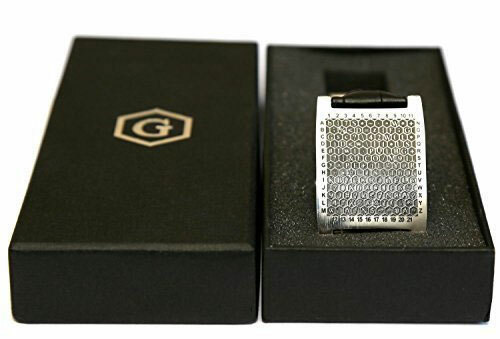 And surprisingly, the Enigmaze Internet Password Bracelet may be the best of those 3 decisions. 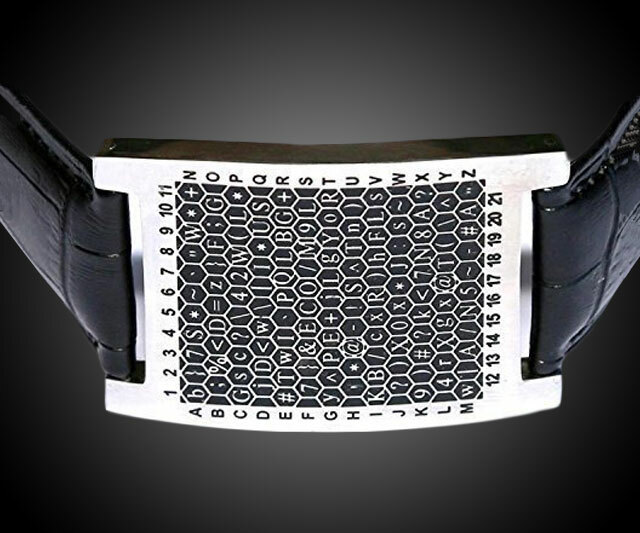 Enigmaze's gobbledegooky-looking wristband contains a grid of letters, numbers, and symbols you can add to the beginning / end / middle of your existing, presumably weak or overused passwords to make them harder to crack. Then when even you can't remember them, you can refer to the bracelet's grid for the key. For example, if your current password for your email, Amazon, online banking, and Netflix accounts is fishtacos, you can strengthen it with the Enigmaze by selecting an outer letter or number from the bracelet - say "C" - and appending a few of the characters that follow. Take the first 4 after the "C" row, and you end up with fishtacosGsc?. Or Gsc?fishtacos. Or fishGsc?tacos. Then select a different row or column and different insertion point for the other sites where you use the password. 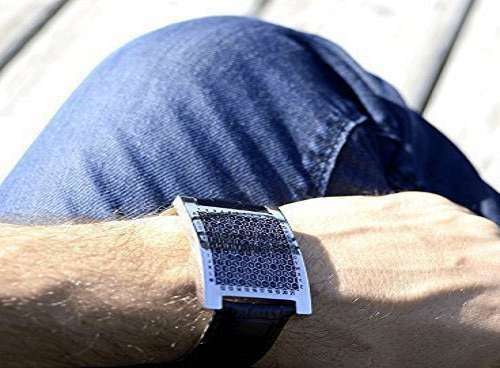 Enigmaze notes that if you lose or forget the bracelet you can always consult their Amazon page, or the PDF instructions you get when you buy it, for the key. Which kind of makes me wonder why you'd buy it in the first place if you can just use its image. Look at it online, save it to your desktop, print it out and keep a copy in your desk. 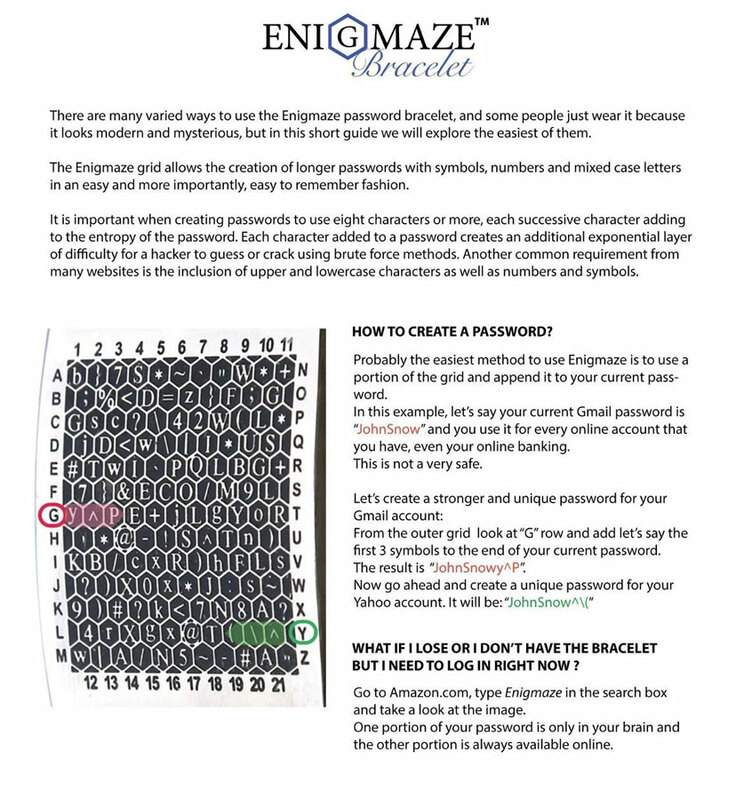 Or spend an hour making your own Enigmaze grid. The other thing I wonder is, once I've selected Row C to fill in my existing password for one account, and Row G for another, and Columns 6 and 18 for the third and fourth, how the Row F am I supposed to remember which rows and columns go with which passwords? Or which rows and columns I've picked in the first place? 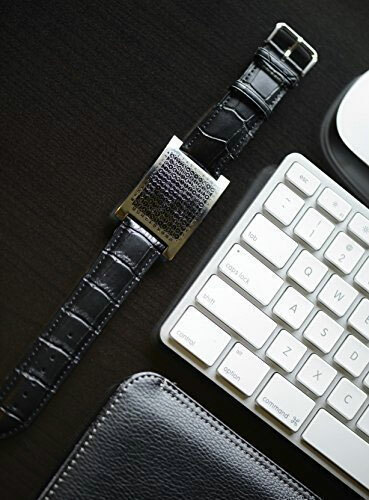 The Enigmaze Internet Password Bracelet key is laser-engraved into a 0.25" stainless steel plate, and affixed to a genuine leather strap.